This little book is jam packed with some basic ways that you can take care of your health in a natural way. 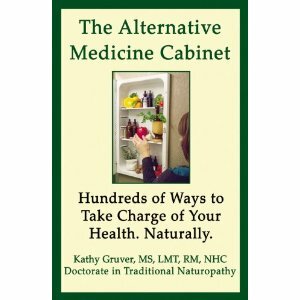 The author of this book has a doctorate in naturopathy and has a sensible writing style, easy to read, understand and easy to follow ideas and solutions, most of which I would say are preventative measures. When I sat down to look at this book I was taken in right away and ended up reading the whole thing in one sitting. Some of the categories/chapters include massage, women’s issues, pregnancy, obesity, energy boosters, sleep , cancer and so many other common concerns people have. I found the book to be inspiring and one thing I really enjoyed was the positive attitude” message. Dr. Gruver makes it abundantly clear that our minds have a lot of power in our lives. As the saying goes, “you are what you eat,” we are reminded in this book that we are what we think too. This is a great book and guide for someone who wants to learn how to take charge of their own health in a natural way, ways to boost our immunity and how to empower ourselves to be an active participant in our own medical/health lives. I thoroughly enjoyed the book and I will surely be referring to it again and again. I think I just may pick this one up! Thanks! Another great review:) I need it for the Energy boosters and sleep sections!